SBI’s family of Lenti-Labeler™ constructs facilitate a wide range of studies—including cell tracking, high-throughput assays, and more—by enabling efficient and reliable labeling of your cells. The pLL-CMV-rFLuc-T2A-GFP Lenti-Labeler construct co-expresses rFLuc and GFP from the CMV promoter, which delivers strong expression in most commonly-used cell lines (HeLa, HEK293, HT-1080, etc.). Available as either fully propagatable, sequence-verified plasmid DNA (Cat.# LL300PA-1) or ready-to-transduce pre-packaged lentivirus (Cat.# LL300VA-1), SBI’s pLL-CMV-rFLuc-T2A-GFP Lenti-Labeler is designed for reliability, so you can get to valuable insights faster. 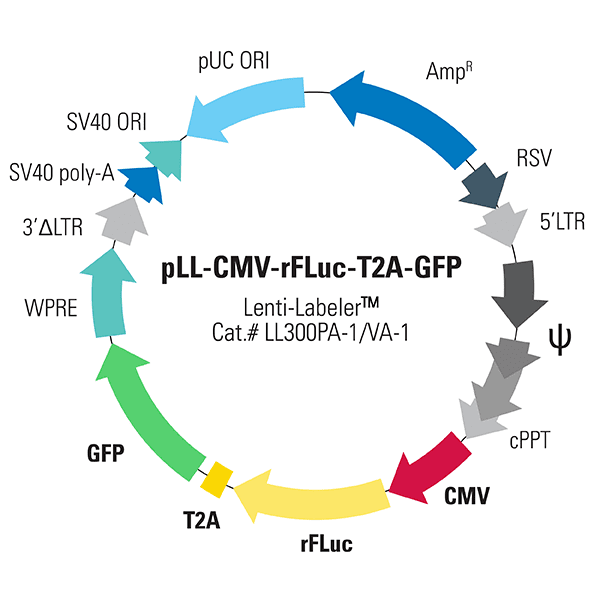 While the pLL-CMV-rFLuc-T2A-GFP Lenti-Labeler construct is compatible with most second and third generation packaging plasmid mixes, SBI recommends the use of pPACKH1 (Cat #LV500A-1) and TransDux MAX Transduction Reagent (Cat #LV860A-1) to achieve optimal virus titers and infection of target cells. SBI offers a Lenti-Labeler constructs with a range of selection markers, reporter genes, and two different promoters. Figure 1. SBI Lenti-Labeler constructs reliably and efficiently label cells. Comparison of the number of fluorescently-labeled cells to the total number of cells seen in the corresponding phase contrast images reveals the high labeling efficiency of SBI’s Lenti-Labeler constructs. Figure 2. Dual reporter Lenti-Labeler vectors deliver robust fluorescence (A) and luminescence (B) signals. Data was obtained three days after infection of MDA-MB-231 cells with the dual reporter Lenti-Labeler Lentivirus CMV-rFLuc-T2A-GFP-mPGK-Puro (Cat #LL310VA-1). Infection efficiency was maximized by using SBI’s PEG-it Reagent (Cat.# LV810A-1) to concentrate the Lenti-Labeler Lentivirus prior to infection.